There are many different variations on a couscous ‘feast’; in her book, Gilberte features a couple, including a festive Algerian couscous. 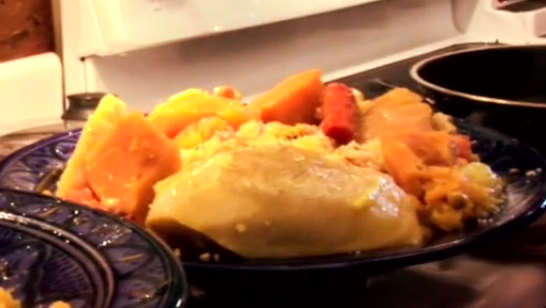 However, for our video she prepared a delicious fall vegetable couscous that is not too difficult to make at home. There is no exact recipe, but we’ve tried to replicate it here as closely as possible. 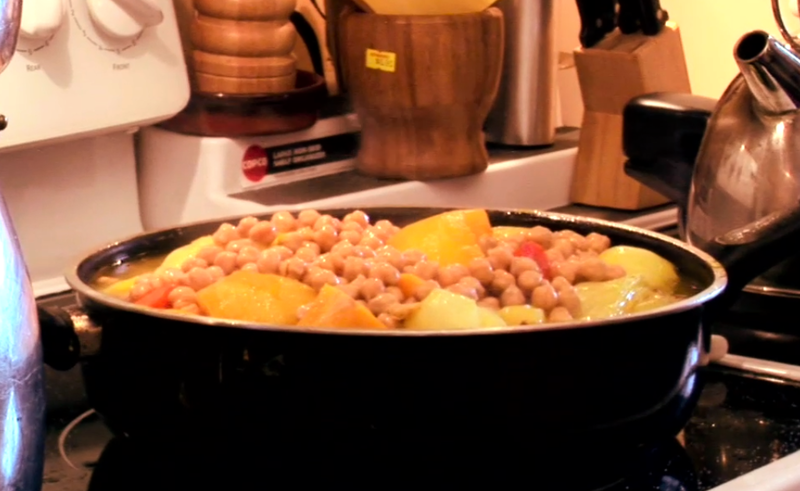 The video of Gilberte making this couscous will be very helpful for some of the steps. *you can dry out the saffron by wrapping it in aluminum foil and putting it in the oven on low heat. It can then be crushed in the foil and will be ready to use. Alternatively, turmeric can be used to achieve the same colouring. Cover the bottom of a large pan with oil. Fill the pan with the large pieces of vegetable. Add sugar, a generous pinch of salt, and most of the saffron. Cover the vegetables completely with water and put the cover on the pan. Bring to a low boil and simmer until vegetables are tender. Taste for seasoning. Add chickpeas and some pepper and continue to simmer uncovered until they are warmed through. We do recommend using a couscoussier to achieve the light, fluffy couscous that makes this dish so good – but if this isn’t available, there are a few other techniques. Some can be found here, though we cant vouch for them. Put dry couscous in a bowl and cover with water. Drain immediately in a strainer and replace in bowl. Add a generous spoonful of oil and a pinch of salt. Mix with hands and let rest. Over the next 30 minutes, ‘aerate’ the couscous several times by running it through your hands making sure to eliminate all lumps – make the couscous ‘rain’ back into the bowl. After 30 minutes, add water one more time and mix well. Let it stand a few more minutes to absorb all the water. It is now ready to be steamed. To steam: Fill the couscoussier 3/4 of the way with water and put it to boil. Place the top piece on the couscoussier. When it starts steaming, slowly pour the couscous into the couscoussier. * It should take 5-10 minutes to steam. *if adding raisins, place these in the couscoussier before the couscous. 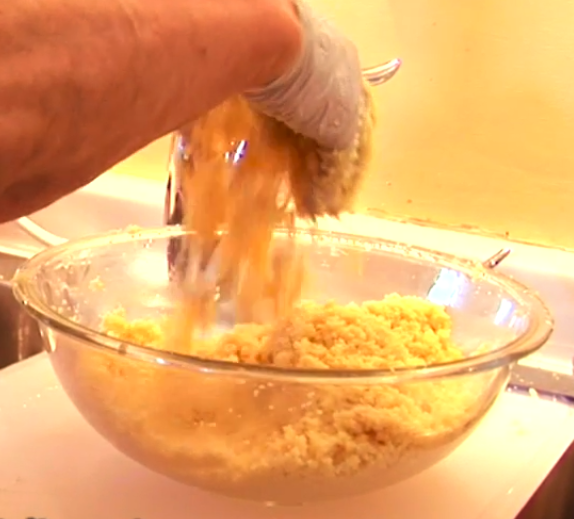 Mix the remaining saffron and slivered almonds into the couscous. Serve the couscous in a deep dish, with the vegetables around it and the broth from the vegetables poured over.